What makes Chardonnay crisp over creamy? How do tannic reds evolve in barrel? From the effects of French versus American oak, here's what you need to know. What fuels the contrast between the steely, stony feel of classic Chablis and the nutty, rounded creaminess of Napa Chardonnay? Apart from the differences in soil and climate, the defining difference is the use of oak. Oak, a hard but pliable wood, is ideally suited to barrel crafting. It has traditionally played a huge role in wine, especially before the advent of cement and stainless steel tanks. Today, at a time when steel, plastic and cement vessels are all valid options, using oak has become a deliberate choice. So why would a winemaker choose to use oak? What does it do to wine? Oak can be a textural and/or a flavor element in winemaking, depending on whether the barrels are new or used, from French or American oak, and their size. It’s the use of new oak that most dramatically influences wine. When wine is in contact with new oak, certain flavor compounds like lactones, aldehydes and volatile phenols leach into the wine, which gives it a number of characteristic aromas. American oak (Quercus alba) imparts rounded notes of vanilla and coconut, while French oak (Quercus robur) brings hazelnut and smokiness. In white wines, particularly Chardonnay, American oak can come across as popcorn and toffee, while French oak results in gentle nuttiness and slight smoke. The affinity between oak and Chardonnay is so great that oak flavors are often taken as a marker for the grape itself. 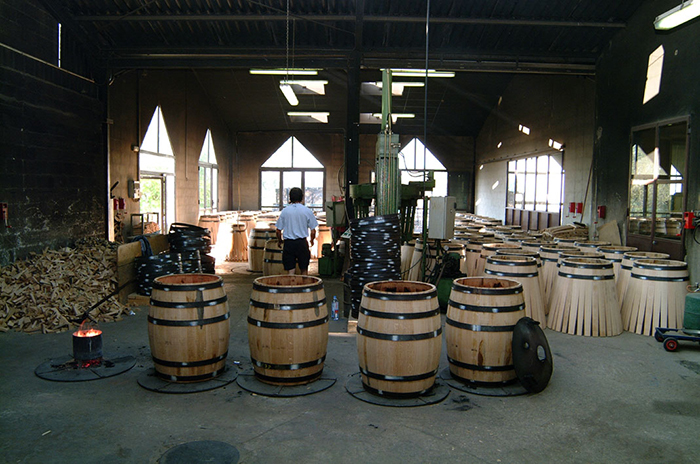 Structural differences in the wood grain means that American oak can be cut into staves to make barrels, while tighter grained French oak needs to be split. However, both need to be air-dried and seasoned before use, and toasted over fire to bend into shape. Toasting also has an effect: higher toast levels amplify butterscotch notes in American oak, and smokiness in French oak. Winemakers can also decide whether to ferment and/or mature in oak. Fermention and maturation in barrels favors better oak flavor integration than fermentation in steel tanks followed by maturation in barrel. However, fermenting in oak is more cost and labor-intensive than fermenting in tank (as barrels need to be topped up and are harder to clean than stainless steel), making it a premium option for winemakers, allowing for more subtle flavors. If not done well, just maturing a wine in toasty oak for a short blast of time can make the desired oak flavor feel bolted-on rather than integrated. Mark Beringer, the Napa Valley winemaker behind Beringer’s Private Reserve Chardonnay, ferments in 100% French oak barrels, of which 75–80% are new. Both barrel size and age matter, as does the time spent in oak. The newer and smaller the barrel, the stronger the oak influence. A 225-liter barrique will have more impact than a 500-liter puncheon due to a higher percentage of the wine being in contact with wood. Meanwhile, a once- or twice-used barrel will soften the effect. Older barrels may no longer impart any flavors and are considered neutral, but they can still play an important role that centers on oxygen. While oak holds liquid without leakage, a miniscule amount of oxygen can permeate the wood. This oxygen presence has a big impact on the natural chemical conversions that wine undergoes during fermentation and maturation. In white wines, it influences the development of certain aromatic compounds. Consider these iconic Sauvignon Blanc styles: the tropical, stainless-steel-fermented exuberance of Marlborough, New Zealand, made under completely anaerobic conditions, as opposed to restrained Sancerre made traditionally in a large, used barrel. Now compare those to the smoky richness of an oak-matured Fumé Blanc—a great illustration of oak versus steel, and larger used barrels versus smaller new barrels. The differences are both in flavor and texture. Both barrel size and age matter, as does the time spent in oak. The newer and smaller the barrel, the stronger the oak influence. A Chablis producer who seeks to emphasise the briskness of the region’s climate and the oyster-shell nuances of the limestone soil can showcase these much better without the added flavors of new oak. The small oxygen exchange from used oak will mute primary citrus and apple aromas, and will put focus on texture and non-fruit flavors instead. “We use stainless steel and used oak in order to show what Chablis really is,” says Hervé Tucki, former technical director of the La Chablisienne cooperative. Barrels, however, are expensive, as is the time it takes to age wines. Rather than put wine into oak, winemakers can also put oak into wine by adding oak chips or staves. 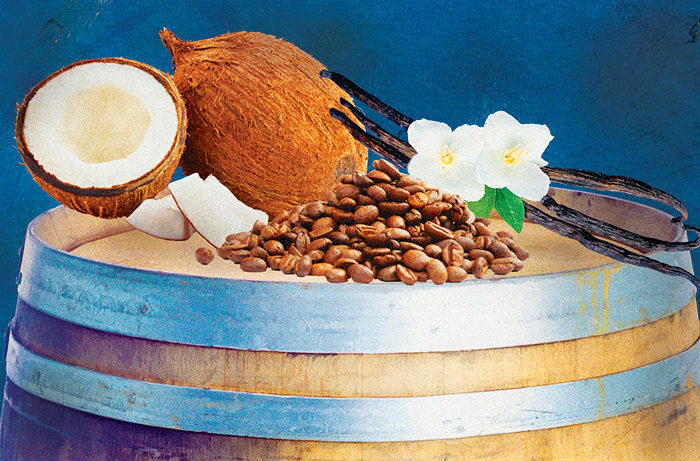 While this can add some of those much-loved toast and vanilla notes both superficially and affordably, it does not provide any of the textural benefits. Her Reserva wines spend at least 22 months in oak. Though the amount of time varies for oak-aged red wines the world over, proper time in quality barrels helps them to age and develop later. Very tannic wines like classed-growth Bordeaux and Barolo often spend extended periods in oak, which is integral to their style. But red wines without oak also have their charm. Oak is not a blunt instrument, and it’s about so much more than flavor. Its use can be fine-tuned to influence texture and aroma, to mute or emphasise, to support or subdue. It adds further options to the already innumerable variables of winemaking.